You've Been To Mars And A Comet; Japan's Space Agency Invites You To An Asteroid Two Japanese rovers touring an asteroid have sent home photos and a video, which were published by JAXA on Thursday. 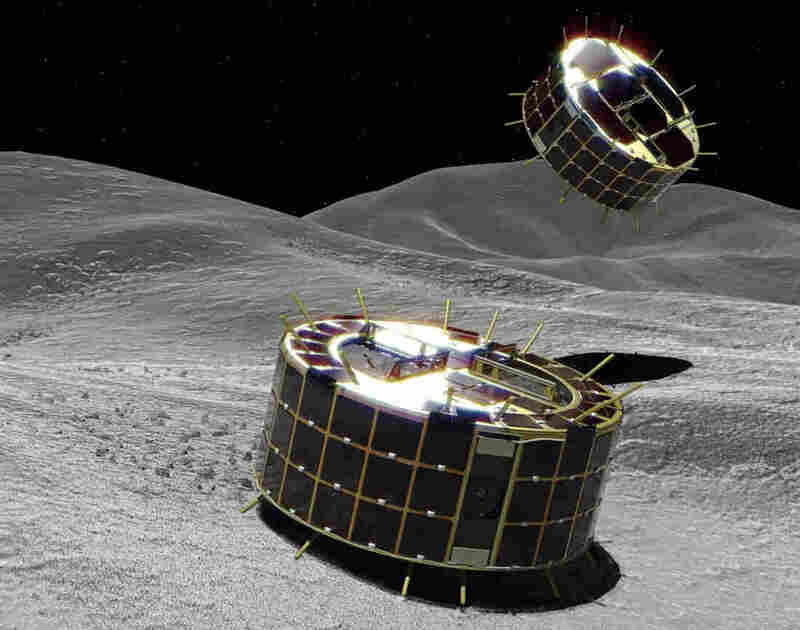 A computer graphic image provided by Japan's space agency shows two drum-shaped and solar-powered rovers on an asteroid. A Japanese unmanned spacecraft released two small rovers on the asteroid Ryugu last week. 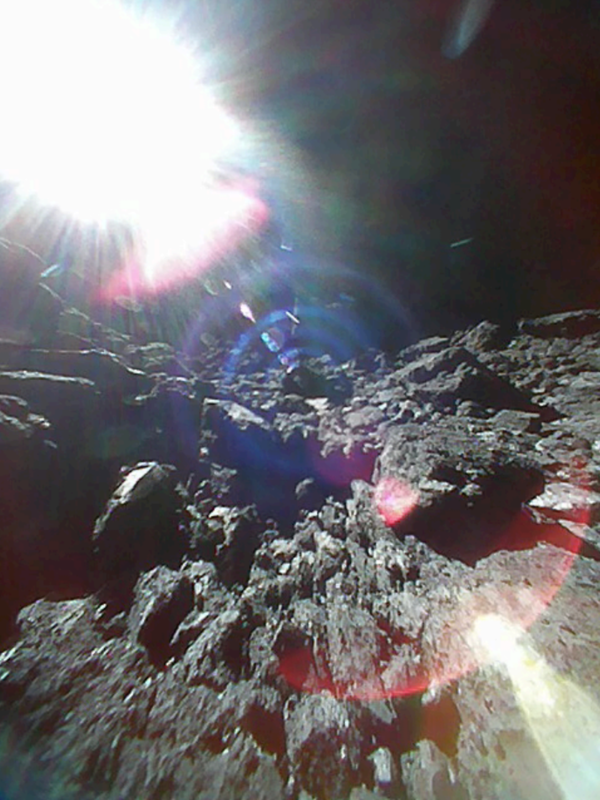 A still from a 15-frame movie captured by one of the MINERVA-II1 rovers on the surface of asteroid Ryugu last week. "Enjoy 'standing' on the surface of this asteroid!" Japan's space agency, JAXA, wrote on their Twitter post containing the video. Part of a collection of media released by the agency, the video shows the rocky surface of the asteroid and the sun moving across the sky, as seen from the asteroid. As seen in the night sky from Earth, the asteroid — and the small rovers on it — are currently moving across the constellation Virgo and positioned between the planets Mercury and Venus. The video, which is composed of 15 frames, was captured on Sept. 23, along with the other media published by JAXA on Thursday. A series of photos taken by the same rover that captured the video confirms a "hop" by the robot, according to the Japanese team, which is a big deal for them. "We were able to confirm that Rover-1B hopped!" JAXA wrote in their tweet containing the photo series. 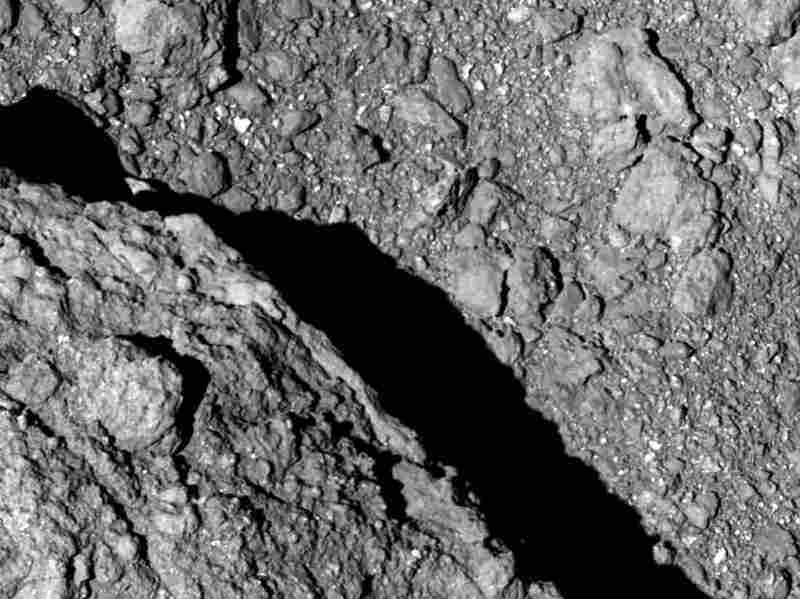 The gravity on the surface of asteroids like Ryugu is very weak. Rovers that move by wheels or tracks would float upwards as soon as they started to move. So the rovers hop instead. "Within the rover is a motor that rotates and causes the rover to "hop" (jump up) during the rebound," JAXA says on its website. That hop propels the rovers off the ground for up to 15 minutes and allows the rover to move up to almost 50 feet horizontally along the asteroid's surface. As quoted on JAXA's site, project manager Yuichi Tsuda was at a loss for words when the rovers' on-asteroid hopping ability was first confirmed on Sept. 22. "I cannot find words to express how happy I am that we were able to realize mobile exploration on the surface of an asteroid. I am proud that Hayabusa2 was able to contribute to the creation of this technology for a new method of space exploration by surface movement on small bodies," Tsuda said. According to the JAXA website for the mission, the two hopping rovers that have captured the media are called Rover-1A and Rover-1B. The rovers were stored within a container called MINERVA-II1. The container was launched from the spacecraft Hayabusa2 last week and that spacecraft is currently orbiting the asteroid. MINERVA stands for Micro Nano Experimental Robot Vehicle for Asteroid. The twos in MINERVA-II1 and Hayabusa2 come from the fact that this is a successor mission. However, the first Hayabusa failed to land its hopper, the original MINERVA, on the surface of the asteroid Itokawa more than a decade ago. "The image taken by MINERVA-II1 during a hop allowed me to relax as a dream of many years came true," Takashi Kubota, a spokesperson for the project was quoted as saying on the project's website. Both the series of hopping photos and the video were taken by Rover-1B, which, despite having the designation of being the "B" rover, seems to have stolen the show. However, Rover-1A did capture an image which displays the shadow of its own antenna and pin. The pins on the rovers have a few roles: they increase friction when hopping, protect the solar cells that power the robots when landing, and a few of the pins have a sensor that can measure the asteroid's surface temperature directly. Because Ryugu is a primitive asteroid, NPR's Bill Chappell has reported, studying it could help scientists understand the evolution of Earth as a planet and learn more about how the solar system works. While the Rover-1B might think it is the center of the solar system following its video premiere, both rovers and their asteroid host are currently in between the orbits of Earth and Mars more than 100 million miles away from the sun.